Jazz Guitar Chords for Ending a Song! 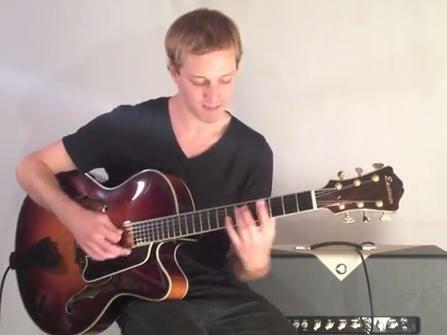 Here´s some cool chord voicing for ending a jazz standard! And please don´t forget to check out the lastest DVD from Jon! Thanks for the common tone lesson – when does one differentiate between a #11 and a b5? Is it related to the order of the notes in the particular voicing? Thank you for lesson. This is more of what I’ve been looking for. You’ve peeked my interest. Looking forward to seeing if you are offering what I’m interested in learning. Thank you at a time like this it helped me , took me while to get the chords to feel more comfortable, hope I can get the tabs sent for them. What beautiful chords and so well presented! Thank you very much for that! A new challenge for me! With only 3 fingers to work the fretboard with I have to figure a way to play these. Hey! I saw a guy on t.v. playing with his feet. I can do this! I am a guitarist playing for a long time since when I am interested in learning jzz I went through several books etc could you pls tell me how to fix a chord in jazz music for guitar. kindly let me know the theory in jazz. Thanks for the lessons!It is totally awesome!!! Hi I very appreciate that lesson. thank you so much. can you tell what does that mean chord progression6? you said that the common tone is F in the begining….at the end you say its not in the last chord “because we’ve resolved to Fmaj7….im confused….how can f not be in f maj7? Jazz is an expressive form of music. The chords you presented are very expressive and are pleasing to the ear. By all means please continue these beautiful lessons. Lovely send me free videos pls.